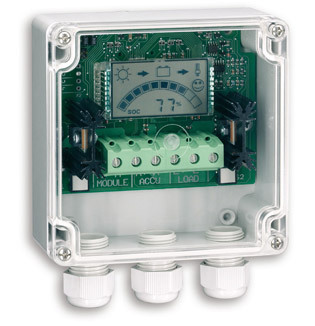 The functionality of the Steca PR 2020 IP is based on the Steca PR line of solar charge controllers. This is equipped with a a large display which shows the current state of charge (SOC) as a percentage and graphically in the form of a tank. The key component of the charge controller is the state of charge determination, which has been significantly improved. The auto-adaptive state of charge algorithm results in optimal battery maintenance and control over the module output of up to 480 Wp which can be connected to it. The Steca PR 2020 IP has been specially designed for operation in difficult environments with high salt, moisture and dust content.